In their wildly interactive shows for children and families, silly six-piece band Your Song My Song sings you through watery adventures, recycling kid revolutionaries, classic children's books, jungle expeditions, and deep sea dives! 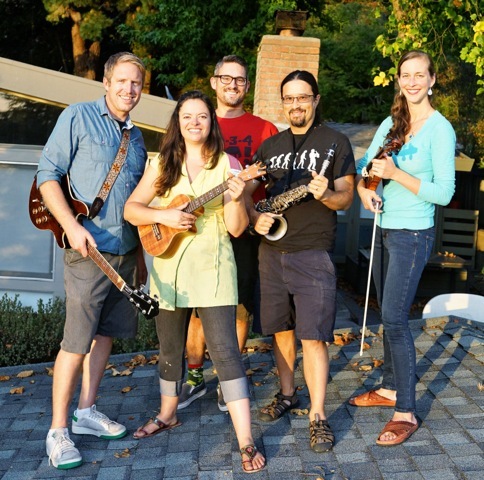 Singer and ukulele player Jaime Lee Currier weaves tales of friendship, love, and learning, while guitarist Eric Hart, violinist Rainbow Rubin, sax player, Hank Ibser, bassist Joe Shaughnessy, and drummer Nick Jackson keep up a rockin beat. Come sing along and laugh, shout, dance, and imagine with Your Song My Song and their classic kid hits, interactice improv songs, and new original story adventure songs which they've performed in a multitude of parks, schools, camps, libraries, clubs, festivals and museums throughout Northern California. Your Song My Song's first not-JUST-for kids CD, Off The Blue, features "What Up Kids," "Slippery Fish," and a rousing interactive rendition of "Old MacDonald”.